Last Friday night in Memphis a billboard featuring gay soldier, Tim Smith, was ripped to shreds by vandals. 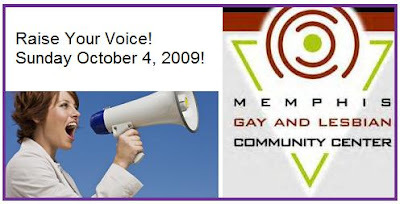 Memphis Gay & Lesbian Community Center is holding the "Raise Your Voice Rally." In response to the disrespect shown to our community and to former marine Tim Smith, Memphis Gay & Lesbian Community Center is on a campaign to change the Mid-South. Join us for a rally on Sunday October 4 at 1:00 pm on the front steps of First Congregational Church 1000 S. Cooper St. to unite our community in the face of hatred and intolerance. Then join us afterward at Memphis Gay & Lesbian Community Center to show the Mid-South that we are committed to change. We will work to make our city safer. We will foster tolerance of lesbian, gay, bisexual and transgender people. In the face of intimidation … RAISE YOUR VOICE! In the despair of silence … RAISE YOUR VOICE! In defiance of shame … RAISE YOUR VOICE! To the deceit of the closet … RAISE YOUR VOICE! Against the stench of hatred … RAISE YOUR VOICE!